Yahoo- Two weeks before the NBA trade deadline, a rival player called Lou Williams. The Houston Rockets’ James Harden watched Williams flourish this season, helping lead the perennial All-Star’s hometown Los Angeles Lakers to a strong start, and he had an idea to pitch. The Rockets have been a surprise this year. A team that wen't from barely squeaking into the playoffs last year, to the #3 seed this year. 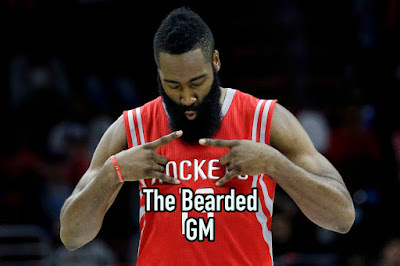 It mainly has to do with the emergence of James Harden's game. Yeah the guy has been a scoring stud the past few years, but he has stepped up his assist and rebounding game this season. Defense is a different story. Harden has also apparently become quite the GM in Houston, basically orchestrating the Lou Williams trade at the deadline. He went all LeBron on the front office after already calling Lou and telling him that as long as he's cool playing in Houston that Harden is pulling the trigger. Triggered was pulled and Williams is now doing his 6th man role for the Rockets. What's even crazier is Houston already had the other top contender for 6th man of the year in 3-pt champ Eric Gordon. Harden- "I just called Lou Williams and told him we're trading for him." GM-" James you don't have that power"
Harden- "I promise to play some defense, and besides I already told him we would"
GM-" James what have I said about telling other players we'll trade for them?" Harden- "That it's wrong and I shouldn't get their hopes up because sometimes it doesn't work and it makes you look like the bad guy." GM- "Thats right, but I just talked to Lou's GM Magic and he said it's alright. Lou will be here tomorrow." Harden- "Really!?!?! Oh man your the best, I'm gonna go tell the guys!"